It’s been a season of low lows and high highs for Steve Kennedy. This weekend was certainly one of the highs. 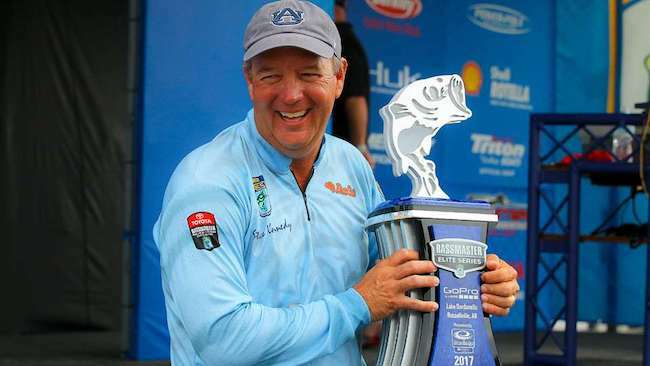 Roughly a month after finishing near dead last at the Elite Series on Ross Barnett, Kennedy found himself as the last man on stage at Lake Dardanelle holding his third Elite Series trophy. The win caps a season that thus far has seen him finish second at the Bassmaster Classic and have two top 40 finishes, while also finishing in the lower third of the field three times. Of course, all the lows go away when holding that trophy. And besides, Kennedy has had himself quite the two-year run. Even before his win, Kennedy had quietly been sitting in the top 30 in our rankings, and after he’s all the way up to 23rd. While Kennedy took the headlines, the rest of the field was doing pretty much what we’ve come to expect, especially within the top 10 of our rankings. Jacob Wheeler bumped up his lead on Bryan Thrift for the top spot, while the only other change in the top 10 was Greg Hackney jumping into the ninth spot, while bumping Keith Combs out to 11th. Looking a little deeper, Kevin VanDam continues his trek back up the rankings, as he’s in 22nd after the weekend. KVD has now beaten 75 percent of the field in five of his last six Major events. Meanwhile, another former No. 1, Brent Ehrler, has fallen to 33rd after his rough time in Arkansas. Ehrler is always remarkably consistent, but each of the last three seasons, now, he’s had one bomb of a tournament that weighs down his average.